The world was taken back by a terrible tragedy at the Boston Marathon on Monday, April 15th in Boston, MA. Quite a few explosives had went off at the finishline of the 26.2 mile race. A few days later, on Friday, April 19th, the City of Boston went on lockdown as the brave law officials of MA successfully went on a manhunt for the two suspects believed to be involved in the marathon bombings. Meanwhile, the Boston Red Sox announced that the game that was to be held on that friday would respectfully be postponed for the following Sunday, April 21st. I was fortunate enough to have the opportunity to attend that game. It was the first baseball game I’d ever gone to, and it was alot better than I’d expected it to be. I say this because I’m not necassarily a huge fan of baseball. In fact, I was sure that my boyfriend was going to have to explain the entire game to me each step of the way- a play by play. But after the first inning, I was pretty sure I knew enough of the game to follow along all by myself. And soon after, I didn’t have to wait for the crowd’s reaction to know what was going on. I was even confident enough to explain to my boyfriend what he had missed while he was in the restroom. I was a little sad that we didn’t stay for the entire game. Though, I wasn’t too upset; it was 37 degrees out that night and we left a little early hoping to alleviate ourselves from our cold, shivering bodies, and also in hopes of beating the rush to the train back to Riverside. Apparently we weren’t the only ones with the big idea, because we actually had to wait for the second train because the first one was overcrowded, which I didn’t mind at all. When we first entered the gates into the stadium, we realized that we didn’t dress nearly as warm as we should’ve, so we browsed the gift shops in search of hoodies and jackets. Being disapointed at the outrageous prices, we only left the gift shop with a hat for him, and a pair of oversized gloves for me. We were still cold, but those assessories did help a little. The drinks we ordered at the bar was also of some help to us. I ordered a Cranberry and Vodka, and he ordered a draft beer. We then took our drinks back to our seats, where we were greeted by a waitress whose name I wish I can remember. She told us that she would be helping us that evening and all we had to do was call her over and we can place our orders. I thought that was pretty cool. I had no idea that there were actual open bars at baseball games, nevertheless, a full waitstaff as well! It surprised me at how interested I was in the game. Before I was invited to the game, I had heard that baseball was not a very fun sport to watch; only to play. But once I started to understand what was going on, I became excited to see the game unfold. I decided to tell about the experience of my first baseball game, but I also wanted to share with you the incredible amount of patriotism I witnessed at that game. 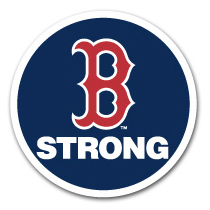 Before I even entered the gates of Fenway Park, I saw many people with posters reading “B Strong”. In fact, even before I even got on the train to Kennmore, I saw many signs on the highway reading, “We are one, Boston”. I was really impressed at the unity of MA, and how supportive everyone seems to be for each other. At the start of the game, there was a small ceremony where they introduced the families of the policemen/policewomen who have given their lives on the line of duty, and also to the first responders of the Boston Marathon Bombings. During the game, when they showed the crowd on the big screen, there were quite a few people with flags and other patriotic paraphernalia. All of the support everyone had for one another in that moment had made me really proud to be an American Citizen. All in all, I really enjoyed the experience of my first ever baseball game at Fenway Park. Even though Boston lost to Kansas City, it was a close game and entertaining to watch.